Longer than England and France were united African Americans have worn dark skins which make their lighter shaded neighbors fret. American Catholics suffered for about a hundred years of abuse but unless they genuflected in public or were from Mexico they looked like other European settlers to America. Irish-Americans also had their “no Irish need apply” signs but that was mostly about Catholicism. The telegenic John Kennedy put most of that paranoia to rest. What his charm couldn’t smooth over the Republican Party’s appeal to the Catholic clergy and the South’s adoption of an issue where they could reciprocate Northern scorn – abortion – built a bridge between the once uneasy allies of the FDR coalition Catholics and Southern Baptists. But blacks were still black and kept at the margins despite the election of Barack Obama after a disastrous Bush Presidency. This remarkable achievement convinced most white Americans that black grievance was at and end and I can not deny the progress. On the other hand I never once sat my white son down to tell him obey all police to avoid being shot. Three stories related to this crossed my path this weekend. The second story came from the PBS program History Detectives. It was a follow up on a previous story that suggested some black slaves fought for the Confederacy. In the case first examined a few years ago the answer to one such example turns out to be no. The fellow below was from Mississippi which had a law preventing slaves from fighting for the state. In this case the black slave was more of a valet to his master. The third story involved the gifted Nora Neale Hurston one of the famous writers of the Harlem Renaissance in the Jazz age. I’ve had her book “Their Eyes were watching God” for a couple years. I handed it to Claudia who told me it was a very good book but for the time being, like so many other of my books, its circling the airport awaiting for clearance to land. Hurston wrote some of her stories of African-Americans speaking in their southern patois much as Mark Twain famously did. The publishing houses demanded that Hurston alter the pidgeon English dialect that she faithfully transcribed and she refused feeling that it denied Mr. Lewis his true voice. Today that slight has been rectified and the book will soon be on the shelves of America’s bookstores. And finally a forth related item that I was reminded of in the Times story. 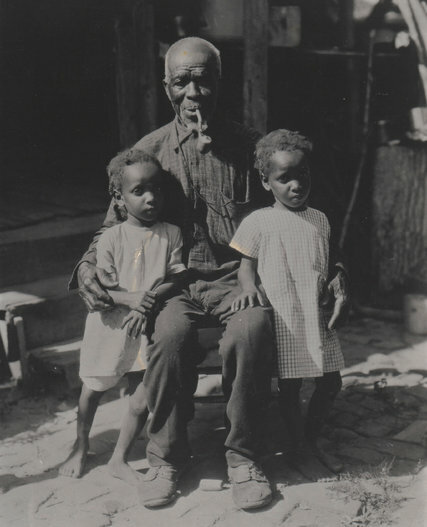 Cudjo Lewis told author Hurston how strange it was to be placed with long time slaves who he could not understand and who no doubt regarded him with some perplexity. This reminded me of a movie I thoroughly enjoyed long ago. 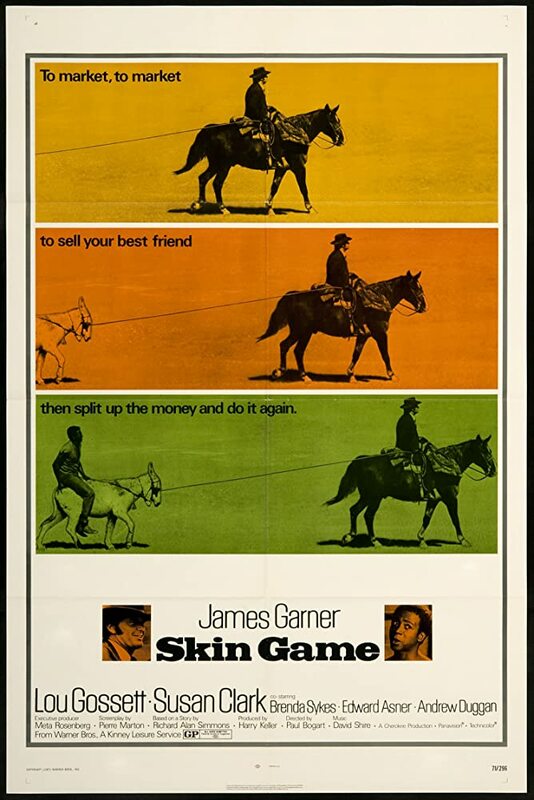 The movie Skin Game came out in 1971 when I was a sophomore in college. It starred my parents favorite actor James Garner and Lewis Gosset Jr.. Ed Asner plays a cruel slave catcher. Its set in the pre-civil war south. Its about two friends who defraud southern slave owners by selling them Louis Gossett Jr. over and over. Each time Gossett is rescued by his seller Garner and then they skip off to grift new victims. As you can imagine its a dangerous game and in the climax the tables are turned on the con men. Gossett finds himself housed in a barn with three or four African warriors, who like Cudjo Lewis were straight off the slave ship. I suspect this movie still stands the test of time although I noticed it was not listed as one of the best movies about slavery on at least three Internet lists I found. Here’s the IMBD list. I think this is an oversight. BTW – James Garner was one of the Hollywood actors who championed Civil Rights. My parents loved him for his TV western Maverick.